Koh Kood is located around 45Km from the mainland and is accessible only by passenger ferry and speedboat. There isn’t an airport on the island, although the Soneva Kiri Resort does have a private airstrip on a nearby island, for its very well-heeled guests’ to use. There are three passenger boat companies running regular services to Koh Kood from Laem Sok pier on the mainland. These are ‘Koh Kood Princess’ and ‘Ko Kut Express and ‘Boonsiri Ferry. These three companies all operate large, modern vessels. The Koh Kood Princess is the largest, this can both seat around 300 passengers. Ko Kut Express run both a large passenger boat and also a speedboat service. They took over the running of the Siriwhite speedboat, which you will see mentioned on some websites, and re-branded it at the Ko Kut Express Speedboat in 2015. As yet, there are no vehicle ferries to the island. Which ensures the island remains far quieter than other large islands in Thailand. However all boat companies provide secure parking for passengers arriving by car. The boat company’s ticket offices and parking areas are all marked on the map at the bottom of this page. Some of the luxury resorts also run their own boat services for guests, so if you are staying at a 5 star hotel then it’s worth inquiring if they include the transfer when booking a room. Going to Koh Mak? The speedboat timetables are here. During the Low Season, the large passenger boats all leave around the same time from the mainland and from Koh Kood. The Boonsiri ferry just runs once per day. In addition, some services may not run if the boats are undergoing annual maintenance. Note the Koh Kood Express speedboat is no longer running during low season. Laem Sok is located at the very southernmost tip of a peninsula about 20 minutes drive from Trat town. The ferry piers for Koh Chang are around 45 minutes drive and Trat Airport is an hour away. 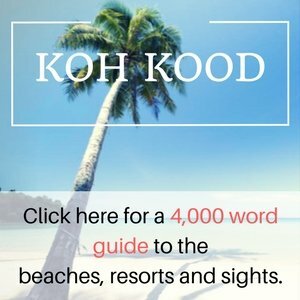 How to book boat tickets to Koh Kood? There’s very little else on this peninsula apart from some local hamlets; fishing and farming communities; a large area of protected mangroves and a couple of resorts. The aging Ban Pu Resort and the far nicer, newer Analay Check In and Chill Out. This is a new resort located a stone’s throw from the ferry pier and ideal for anyone arriving late afternoon and wanting a good value place to stay before catching the boat the next morning. It is important to note that the boats to Koh Kood stop running mid-afternoon, even in High Season. From November to May the last scheduled departure is the Boonsiri Catamaran at 14:20. ( In Low Season the last sailing is at 13:00 ). If you are arriving after this time and want to get to Koh Kood the same day, the only option is a private speedboat. However, that isn’t cheap, expect to pay around 16,000 Baht for a one way trip. And the last time it is possible to take the speedboat is around 16:00. So getting to the pier the same day you want to get to Koh Kood requires either a very early start from Bangkok or having a night in Trat. If you are coming from Koh Chang, then all you need to do , during High Season, is buy a ticket for either the Bangbao Boat or Kai Bae Hut speedboat service. They both run daily services from 1 November until 30 April. However, it is important to bear in mind that from May to October, there are no inter-island boat services. So getting from Koh Chang to Koh Kood during the Low Season entails having to head back to the mainland. Make sure you are aware of this when booking an off -season, two island holiday. As there are only passenger boats to Koh Kood, arranging transport direct to your hotel isn’t possible. Fortunately, when you arrive on Koh Kood, all boat services provide transport to your resort. There is no additional charge for this as it is included in the price of your boat ticket. Likewise, when you return from Koh Kood to the mainland, the transport from your hotel to the pier is included in the price. The exception is with the Koh Kut Express Speedboat – which picks up from resort piers on the west coast of the island from locations including, and north of, Bangbao Bay. This just leaves you to plan how you will get to the mainland pier. If you are flying into Trat on Bangkok Airways flight PG301 or PG305 then you will be able to get to Laem Sok and onwards to son, you will have to take PG301 in order to reach the ferry pier in time for the last boat of the day. There are regular bus services from Bangkok to Trat and it is also possible to take a public minibus from Ekkamai or Morchit bus station. For anyone staying in Trat, all the ferry companies provide transport, by ‘songtaew’ shared pick up truck taxi, from hotels in Trat to Laem Sok pier. The price is 38 Baht per person, payable to the driver. You’ll be able to buy your boat tickets a from your hotel in Trat when you arrive. Or they can be booked direct with boat companies online. However, outside the peak New Year and Thai New Year (Songkran) holidays, advance booking isn’t usually required. As already mentioned, private transfers by car or minibus are available from Trat Airport. But they can also be arranged for people heading to Koh Kood from Don Meuang Airport, Suvarnabhumi Airport and hotels in Bangkok or Pattaya Airport. Prices are from 4,400 Baht for a private car from a hotel in Bangkok to the pier. More prices and online booking. If you are flying into Don Meuang then you’ll need to be on a flight that lands before 05:00 to be sure of getting to the island the same day, and from Suvarnabhumi Airport, a flight that lands before 06:00. 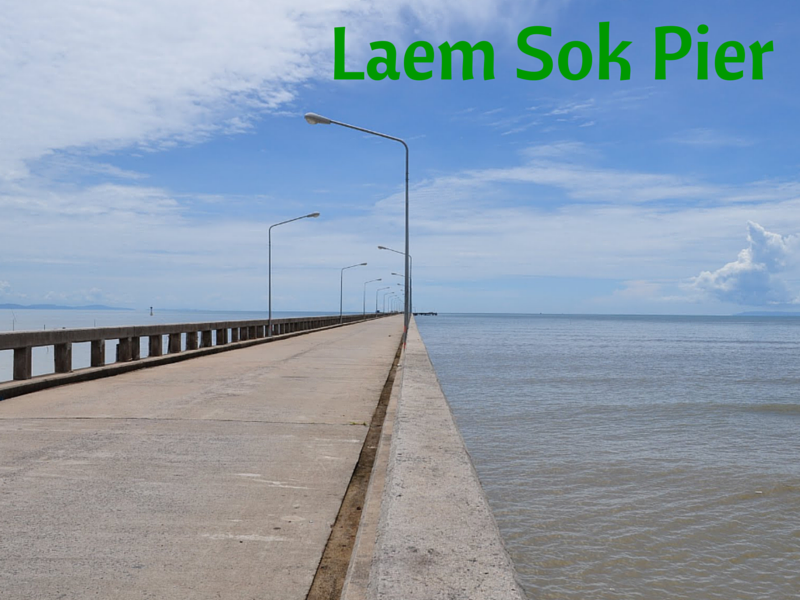 Laem Sok pier is a very ‘no frills’ pier, just a long concrete pier stretching out into the ocean. Fortunately, the boat companies provide comfortable waiting areas complete with toilets, coffee-shop, simple restaurants and car parks for people waiting for their boat. This main pier is where the large passenger boats depart and arrive. There is a separate pier, known locally as ‘Coral pier’, about 5 minutes drive away, which is often – but not always – used by speedboats from resorts and the Koh Kut Express speedboat. Hopping from Koh Chang to Koh Mak and Koh Kood during the High Season is very easy. You can use the two daily speedboat services to get from Koh Chang to the outlying islands. The two services are run by Kai Bae Hut Speedboat and Bangbao Boat. Ticket price is 600 Baht to Koh Mak and 900 Baht to Koh Kood. This also includes pick up by taxi from your hotel on Koh Chang to take you to the departure point. The boat will drop you off at your resort’s pier – or the nearest point on Koh Kood. The furthest south they stop on Koh Kood is at the resorts in Bangbao Bay. It takes around an hour and a half to two hours to get from Koh Chang to Koh Kood. This includes a brief stop on Koh Mak when some passengers will get on and off. If you are staying at the north end of Koh Kood, for example at Baan Makok, then you’re journey will be about 20 minutes shorter than someone staying much further south on Koh Kood e.g. at Siam Beach Resort in Bangbao Bay. Oct 2018 update: Boonsiri Ferry have recently announced they will be running a Koh Chang – Koh Mak – Koh Kood service starting in late 2018. The ticket price from Koh Chang to Koh Mak is 500 Baht and from Koh Chang to Koh Kood it is 750 Baht. This high speed catamaran can seat 200 passengers in air-conditioned cabin, plus has free wifi on board. There are no boat services between the islands during the Low Season. we are arriving at Suvarnabhumi at 23:00 on 3rd of June. could you please advise, how it will be better for us(travelling in group of 12 people) to reach Koh Kood, as we are travelling with childrens? You can stay the night at a hotel near the airport and then early next morning ( 5 or 6am ) take a private transfer to Laem Sok pier. You will need two minibuses for 12 people. Assuming the flight is on time then you won’t have any problem catching the 10:45 Boonsiri ferry. Do boats run from Koh Kood to Koh Kai, I will be looking to get a boat on the 12th April. we are landing 19.04 at 5:00 on Suvarnabhumi airport, how we could get to Koh Kood. I checked tickets at https://12go.asia/en and it is showing that we could go by BUS to Trat (14 in Trat) but it is do not showing tickets for boats at 15 o’clock. Could you suggest something ? we are looking for a Transport from BKK Suvarnabhumi to Koh Kood in the morning of Sat. March 30 for 2 Pax. What is the easiest option to do this ? If you are landing early then you can get to Koh Kood the same day. The last boat is at 15:00. You will need to take a private transfer from the airport to Laem Sok pier, then take a passenger boat to the island. See: https://iamkohchang.com/getting-here/car-minibus-transfers.html for transfer booking. The other option is to fly to Trat on either flight PG301 or PG305 and then take a minibus or private transfer to the pier. From Koh Kood (Bann Makok) on March 20 in the afternoon to go to a hotel near the airport TDX Trat. When you are on Koh Chang, buy tickets for either the Kai Bae Hut Speedboat or Bangbao Boat Speedboat. They will drop you off at Baan Makok. The last boat off Koh Kood is at 13:00. Take that and then, either a private transfer or pick up truck taxi to your hotel in Trat. No. Unless your hotel can send a private speedboat. But that will be very expensive, around 18 – 20,000 Baht. Stay the night in Trat or Koh Chang, and then next morning go to Koh Kood. We will arrive on Friday March 8th at 12.40 at Trat. Is the speedboat at 15.00 running at that date to Ko Kood or do we have to take the boat at 14.20 ? The speedboat runs every day at 15:00 during High Season, so no problem to take it on 8 March. We’d plan to go Koh Kood on March. Do we need to buy the boat tickets (earlier) online? We want to catch a PG306 (13:10) flight from Trat Airport to Bangkok. You can buy boat tickets from your hotel when you are on Koh Kood. No need to book online. If you arrange a private transfer at 11:15 from the pier to Trat Airport you won’t have any problem getting to the airport in time for flight PG306. We want to take a PG305 flight (landing at 12:40 in Trat) on 9th January. Is it possible that we will reach the pier for the last boat at 15:00? That isn’t a problem. You can take either the shared minibus or a private transfer to Laem Sok pier and will be able to take the 3pm Ko Kut Express speedboat. It is about 1 hour drive from the airport to the pier. Wij vertrekken 6 januari van Ko Chang naar Ko Kood. Kunt u ons uitleggen hoe lang de houten boot vertrekt en erover doet en wat de kosten zijn inclusief als we opgehaald worden van ons hotel op Ka Bae? The wooden boat takes around 3 and a half hours to get to Koh Kood. The ticket price is 750 Baht per person. This includes transfer from your hotel in Kai Bae to the pier in Bangbao. I would like to book tickets for the ferry to Koh Kut. Is it only the one ferry company that has online booking. You can buy tickets when you arrive at the pier. No need to book online. But it is best to arrive at the pier as early as you can, just in case one boat is full and you have to wait for the next one. As you mentioned, last Ferry for Ko Kut is 15:00, right? Assuming the high season schedule will be the same as last year. Then yes. If it changes, then the last boat will be the Boonsiri Ferry at 14:20. But at the moment the high season schedules haven’t been confirmed. for the speedboats. Hello, in january/february 2019 we will be cycling in Thailand. After cycling in the Isaan we like to go from Trat to koh Kood, koh Mak, koh Chang to Chantabury. Is it possible to take our bicycles with us on the boat to koh Kood and from koh Kood to koh Chang? You can take your bicycles on the passenger ferries from the mainland to Koh Kood. Then from Koh Kood to Koh Mak you should take the Boonsiri Ferry, as the speedboats won’t allow bicycles. From Koh Mak to Koh Chang you can take the wooden passenger boat operated by Bangbao Boat. 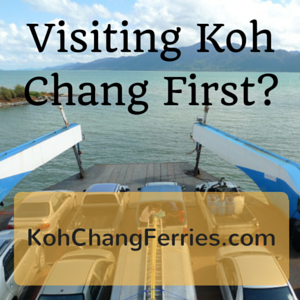 And from Koh Chang to the mainland it is easy to go on the large vehicle ferries. We want to hop from Koh Kut to Koh Mak and then to Koh Chang with 2 bicycles in december 2018, can we take a boat to Kai Bae (avoid the sepentine above Bangbao😊)? There is a speedboat to Kai Bae from Koh Mak. But if you have bicycles you’ll probably need to take the wooden boat to Bangbao. It’s rare the big passenger boats to Koh Kood are cancelled. Although one was damaged in a storm last week and is out of service for a couple of weeks. There are only speedboats to Koh Mak. So more chance of them being cancelled if there is very bad weather. There aren’t any boats from Koh Mak to Koh Kood in August, so you have to head back to the mainland to get between the islands. We want to go from Koh Chang to Koh Kood 22 July and return to Koh Chang 29 July . Do we need to go back to mainland? Yes. There aren’t any boats from Koh Chang to Koh Kood in the low season. You have to go back to the mainland and then take a taxi about 45Km to Laem Sok pier. I would like to travel from Sianoukville Cambodia to Koh Kood. If the bus arrives in Trat at 2pm will I still have time to catch a ferry or boat to Koh Kood on the same day? If you arrive in trat on time then you’ll be able to take a pick up truck taxi to Laem Sok pier – about 30 to 40 minutes drive away. Then you would be in time for the last boat, the Ko Kut Express speedboat at 15:00. But I think it’s unlikely that everything will run exactly on time, so it’s better to plan for having a night in Trat. Hi i would like to go to Koh Kood from Laem Sok (main land) with motorbike. Koh Kood Princess sometime takes a scooter or two. You will have to contact them to see if it is possible on the date you want to travel . But it is much easier to leave your bike at the car park of the boat company and then rent a scooter when you get to Koh Kood. We’d like to go to Koh Kood tomorrow, february 13th 2018 (2 people). We are at the Journey’s End Homestay, near Ban Chek Bae. The boats from Koh Chang to Koh kood go from Bangbao and Kai Bae on the other side of the island. They don’t pick people up in Jek Bae. You would have to go around to the other side or maybe get picked up at Ao Sapporot ferry pier or White Sand beach. Ask your resort to call thew boat companies and see what is possible. We booked return boat tickets on Boonsiri via 12Go. How do we let the boat company know where to pick us up in Trat? Or do we have to make our own way to the pier? wir haben gerade online ein Ticket bei Bonsiri für die Überfahrt nach Koh Kood gekauft. Am Tag der Abfahrt fahren wir aus Kambodscha zum Busbahnhof in Trat. Gibt es einen Shuttle Service von dort zum Pier?? There isn’t a shuttle service form the bus station to the pier. But you can take a pick up truck taxi from the bus station to laem Sok pier. Good day! we will land at 6:50am in the BKK airport on 29th January. At 8 am we have a private minibus transfer for 5 people(4 adults and 1 baby). So, if we won’t buy boat tickets in advance, is there any risk that all tickets for this and for next boat at 14:20 will be sold out? What is the best way to do in our situation? Thanks you for quick replya! 1)Am i right that 14:20 Catamaran has the route via Koh Mak so it will take not 1 hour to get to Koh Kood pier but 2 hour? Is the sea wavy or calm today and yesterday? The 14:20 boat goes to Koh Mak, so takes longer to get to Koh Kood. The sea is calm. No storm or strong wind. Today some sunshine & also cloud. No rain. Hi, I’d like to buy two tickets for the ferry from Koh Chang to Koh Kood on Thursday 18th but can’t book in the website for some reason – please advise how I can book in advance. Buy tickets from any tour agent when you are on Koh Chang. They all sell tickets for the the Kai Bae Hut Speedboat, Bangbao Boat speedboat and Bangbao Boat wooden boat. Hello, can i buy the ferry ticket at the pier? Cause we don‘t know exactly when we come to the pier. The boat companies all have offices near the pier where you can buy tickets. Hi, which of the large ferries will go from Laem Sok to Nam Leuk Pier in Koh Kood? All the large passenger boats go to Ao Salad in the north east of the island. Koh Kut Express used to go to Nam Leuk pier, but stopped a couple of years ago. I will be arrived at Suvarnabhumi Airport around 1:00 am 16th of December and will drive to Laem Sok pier by car on same day. What is the earliest time of ferry to Ko Koot? And how to get the the Rest Sea Resort? and how far? The first boat is the Boonsiri Ferry at 9am, The boat companies all provide free transport from the pier on Koh Kood to hotels on the island. Take the last boat off Koh Kood at 13:00, as you will have a long time to wait at the airport. There’s no point in leaving earlier than that. All the boats go to Laem Sok pier in Trat. Hi, if I come to laem sok pier by the car how much your covered parking will cost per day? The ferry companies all have their own covered parking for 50 Baht per day. Hi, I understand that there’s a free transfer from Trat to Laem Sok pier. Where do I wait for the transport and what time does it leave from Trat? Thanks so much. The boat companies pick up from hotels in Trat. So if you book a ticket in advance just let them know where you are staying and they’ll pick you up from there. we want to go from Koh Mak to Koh Kood on Oct 29th 2017, is there a speedboat operating or do we have to go via a mainland pier? Hi,my flight will reach trat airport on 1240pm on 5/11/2017 which boat i would like to book? How that i can book transfer to Laem Sok Pier? I will return on 7/11/2017 flight back BKK 1310PM which boat i would like to book and transfer as well. Please see: https://tratairportguide.com/transport-to-koh-chang/ for details of shared minibus service to Laem Sok pier. But from Laem Sok to Trat Airport, only a private transfer is possible. If you are on PG305 then you will need to take the 14:20 Boonsiri Ferry to Koh Kood. We will arrive at Trat airport at about 01.00 am on monday October 30th 2017 and need to take a ferry boat to Koh Kood on the same day. Which public ferry transfer can you reccomend – considering that we will not arrive at Laem Sok before 02.00 am. You have to take the Boonsiri Catamaran at 14:20. That is the only boat you could catch. You will need to take a private transfer from Trat Airport to Laem Sok pier. See https://tratairportguide.com for booking. Trat to Koh Chang and Trat to Koh Kut is the same point of departure in September’17? Can you let me know where is the pier to koh kut? Thanks!! Please see the Googlemap & directions to Laem Sok pier on this page. I am asking if is there any ferry going from trat to koh chang and from koh chang to koh kood, I am planning to stay in koh chang for one night and in koh kood for two nights, that will be in next October from 8 till 11, 2017, I just heard that there is no speed boat available during that time!!! There aren’t any boats between Koh Kood and Koh Chang in October. You will have to go back to the mainland to get between the two islands. Or maybe we still have a chance to depart from Koh Chang Bang Bao Pier to Koh Kood? If not, the private boat transfer is also impossible? (if we can arrange it how much will it cost?). We really need your help as I cannot understand the right information. There are several boats from Laem Sok to Koh Kood. The speedboat might not be be running if the sea is rough, but you can take the Boonsiri Catamaran or Koh Kut Express or Koh Kood Princess from the mainland. You can buy tickets when you get to the pier. No need to book in advance. The 12go.asia site doesn’t have online booking for all the boat companies. You’ll need to take a taxi from the pier for Koh Chang about 45Km to Laem Sok to take the boat to Koh Kood. There aren’t any boats from Koh Chang to Koh Kood during the low season. A private speedboat would probably be around 15,000 Baht. GREAT THANKS for the answers, they help a lot! So, we depart from Koh Chang (13 July), reach Trat Pier, take taxi from there to Laem Sok and take the boat to Koh Kood (speedboat or others). Hope I understand right. How much time will it take by taxi and how much will this taxi cost? And other important question: at what time depart the boats from Laem Sok to Koh Kood? Or till what time? We need to plan the departure..
What will be the price for the boat transfer to Koh Kood? One more question: on 18 July we will travel back from Koh Kood. Are there the fixed departure times from Koh Kood to Laem Sok? And the last one: after Koh Kood on 18 July we will need to take a bus back to Bangkok. Where will we find these buses? I thought to buy the return ticket when we will buy the ticket for the bus or mini bus from BKK when we arrive at 07:20 in the morning on 11 July (we will go directly to Trat and Koh Chang from the airport). Does it make sense to buy return ticket? We will stay in Bangkok for one night and a day before flying back. Thank you and sorry for so many questions again! If you want to take a bus to Bangkok you will have to take the free shuttle from Laem Sok pier to Trat bus station. Buses go about every hour from there to Bangkok. Don’t buy a return ticket. It’s better to leave your options open. I will be traveling from bkk on the 24 July and would like to know if there is a company that can take me from the airport to Ko Kood all inclusive? It is easy to arrange a private transfer from Suvarnabhumi Airport to Laem Sok pier, trat. See details https://iamkohchang.com/getting-here/private-transfers-prices.html You then take a boat to Koh Kood and the boat company provides free transport from the pier on Koh Kood to your hotel. But note that the last boat to Koh Kood is at 13:00. So you need to leave the airport by 07:30 to be sure of catching it. Just stumbled upon the site and found all the information I wanted about getting to Laem Sok and which boat to take. Thanks. Saved me a lot of time searching through Tripadvisor and Lonely planet. We would like to travel from Chivapuri Beach Resort on Koh Chang to Bann Makok on Koh Kood. 3 days later we would like a transfer from Bann Makok to Trat. When you are on Koh Chang, buy tickets for Bangbao Boat speedboat. Ticket price is 900 Baht per person. You’ll be dropped off at Baan Makok. Then, when you are at Baan Makok buy tickets for one of the passenger boats to Laem Sok pier, Trat. Ticket price from 350 – 500 Baht per person. Hi. You can buy speedboat tickets from Koh Chang to Koh kood from your hotel on Koh Chang or any tour agent nearby. You’ll be dropped off at Baan Makok. Likewise from Baan Makok to Laem Sok pier, Trat. Buy tickets when you are at Baan Makok.